So of course I had to try this coffee cake. I used more dark chocolate, added a little more cinnamon, and used pecans instead of hazelnuts. Yum! This coffee cake has a thick batter that bakes into a dense yet cakey chocolate-cinnamon treat. I found that my baking time was less than what the original recipe recommended, and you do want to be careful not to overbake this, or it will be a little dry. 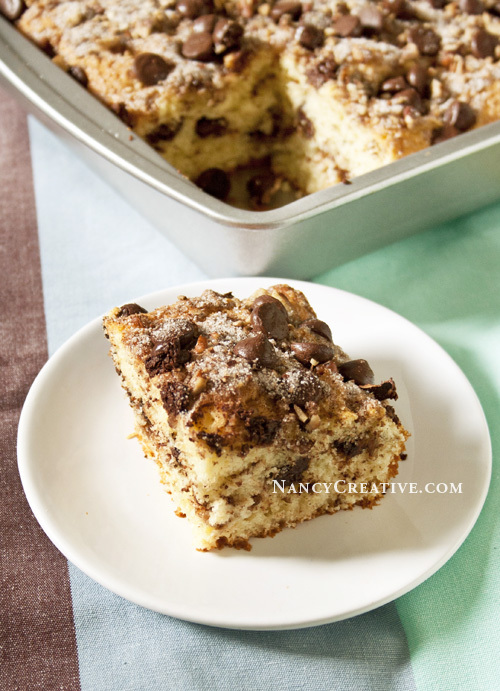 This coffee cake is great for morning or anytime–especially if you are a fan of dark chocolate! Preheat oven to 350°. Butter 8” square baking pan; set aside. Toss pecans, chocolate chips, cinnamon, and ¼ cup of the sugar in a small bowl; set aside. In medium bowl, whisk flour, baking powder, baking soda, and salt; set aside. In large bowl, using an electric mixer on high speed, beat butter and remaining ¾ cup sugar until light and fluffy, about 3 minutes. Beat in vanilla. Add eggs one at a time, beating to blend between additions and occasionally scraping down sides of bowl. With mixer on low speed, add dry flour mixture ingredients in 3 additions, alternating with yogurt in 2 additions, beginning and ending with dry ingredients. You’ll end up with a nice thick batter. Spoon half of the batter into prepared pan and smooth top; top with half of the chocolate/pecan mixture. Spoon remaining batter over this and smooth top; top with remaining chocolate/pecan mixture. Bake cake until top of cake is golden brown and a tester inserted into the center comes out clean, 35-40 minutes (be careful not to overbake, or it will be dry! I recommend checking it after it has baked about 35 to 37 minutes). Transfer pan to a wire rack; let cake cool in pan before cutting into squares, and serve (if you want to eat it warm, let it cool about 10 minutes before cutting). I think this coffee cake tastes best warm myself! It’s been awhile since I’ve made a coffee cake, so this hit the spot! 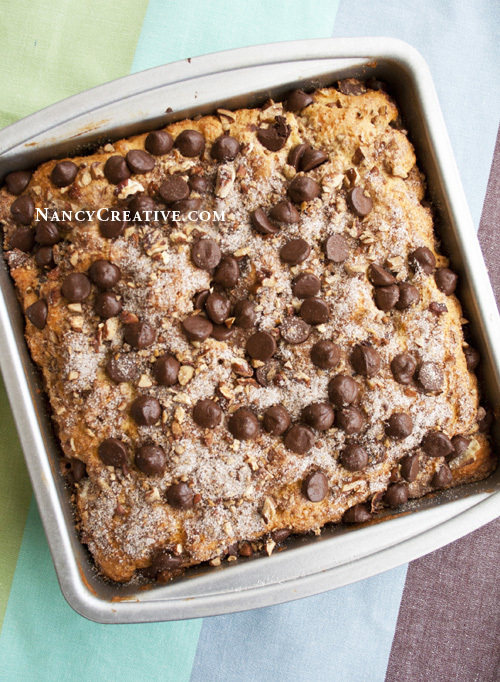 I have a few other coffee cake recipes I’ve been wanting to try. Have you made any good ones lately? Linked to Thursday Favorite Things, Foodie Friday, I’m Lovin’ It, Tickled Pink. This entry was posted in Breakfast/Brunch, Cakes/Coffe Cakes, Food and Recipes, Other Desserts and tagged baking, cinnamon, coffee cake, Dark Chocolate, Greek yogurt, pecans on February 19, 2014 by nancyc. I’m just realizing that I have to mark a lot of recipes from your blog! I’m try to reduce the numbers of coffees per day… but with this cake i can do an exception! Sounds and looks amazing!! I love chocolate-cinnamon combos so I’m going to have to try this sometime! ahhh be still my taste buds, drool., yummmm..I invite you to share at my hop today Hugs! I’m trying to curtail my intake of sweets and then I see this in my reader. It looks mouthwatering and hearty (if that’s the correct word), like a meal wrapped into a gorgeous cake. I have to admit I spent a lot of time staring at your photographs…perfection! Oh my!! This looks so good! Chocolate cake is my favorite! This sounds and looks like the perfect tea time cake. 🙂 lovely recipe! Pinning to my dessert board, to try this soon! Oh yes! This needs to happen at my house soon! This looks yummy! I’m going to try making it this week, do you think doubling the recipe and making it in a 9 x 13 pan would work?